Geocel Sealants, Caulks, Adhesives Alpha Industries Ltd.Alpha Industries Ltd. Founded in 1974, Geocel has built a reputation as a manufacturer of quality sealants, caulks, and adhesives specifically designed for tough construction and repair applications. From general all-purpose to job specific applications, Geocel offers solutions that meet the demands of the professional contractor. Below is a list of our popular products, if you do not see what you are looking for below please feel free to contact us and we can provide you with the information you need. - Geocel 4350 Construction Sealant is a high performance, chemically curing Scypolymer sealant that offers excellent adhesion to many substrates including wood, stone, concrete, metal, glass, tile, brick, and asphalt shingles. Geocel 4350 Construction Sealant can be used as an interior/exterior sealant, can withstand all weather conditions, is UV resistant, and is tolerant to damp surfaces. 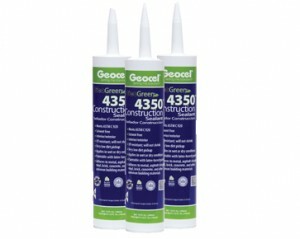 Geocel 4350 Construction Sealant will not shrink and is solvent-free. 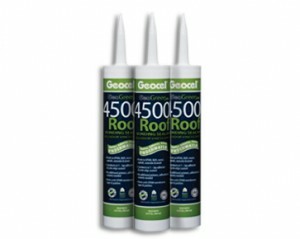 - Geocel 4500 Roof Bonding Sealant is a premium Scypolymer one-component, proprietary, non-solvent bonding sealant specifically designed for roofing applications and systems. The advanced technology of Geocel 4500 Roof Sealant results in a product that immediately withstands ponding water while bonding to many common roofing substrates. 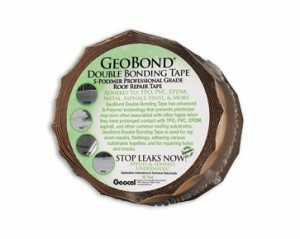 - GeoBond Double Bonding Tape is a double bonding tape that will adhere similar or dissimilar substrates together to form a water tight seal. Its flexible sealing characteristics will adjust with the movement activity of the structure. GeoBond Double Bonding Tape has advanced S-Polymer technology that prevents plasticizer migration often associated with other tapes when they have prolonged contact with TPO, PVC, EPDM, asphalt, and other common roofing substrates. It applies and adheres to wet surfaces below 0°F, and maintains its thermal stability up to 300°F. GeoBond Double Bonding Tape will not crack, harden, or oxidize over time, and it remains flexible to accommodate the natural movements of the roof. - GeoBond Roof Bonding Tape has advanced S-Polymer technology that prevents plasticizer migration often associated with other tapes when they have prolonged contact with TPO, PVC, EPDM, asphalt, and other common roofing substrates. GeoBond Roof Bonding Tape is used to seal holes, tears, and seams in gutters, flashings, skylights, roofing membranes, and more. 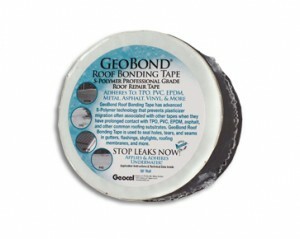 GeoBond Roof Bonding Tape applies and adheres to wet surfaces below 0ºF, and maintain its thermal stability up to 300ºF. It will not crack, harden, or oxidize over time, and remains flexible to accommodate the natural movements of the roof.